The ability to offer packages as optional 'Extras' was an inaugral feature of Timestone Software's Internet Ordering System. One or more packages could be defined as an 'Extra' meaning the packages appeared at the bottom of the list of products and could only be ordered if the customer had already placed at least one of the 'regular' products into the cart. "I want to offer Package X only if they order Package A and I want to offer Package Y only if they order either Package B, C or D and I want to offer Package Z as an extra if they order anything at all". A major upgrade to IOS in 2015 added such flexibility. Package extras are defined in the Filters/Extras tab of an Offer. This tab is essentially divided into two panels. The lower panel lists the packages again with the exception of the package currently selected from the panel above. Amongst the limits is the option to 'Offer as extra'. Checking this option means the package will only be offered as an extra - it will not be available for ordering as a regular package. Once a package is selected from the upper panel it is then possible to use the lower panel to select with which package or packages it will be offered as an extra for and at what price. The lower panel again lists all the packages with the exception of the package currently selected in the panel above. It allows the user to select one or more packages and set the price at which the extra package (selected in the upper panel) will be offered at. The package selected in the upper panel will be offered as an extra to any packages selected in the lower panel. It will be offered at a price set in the lower panel. 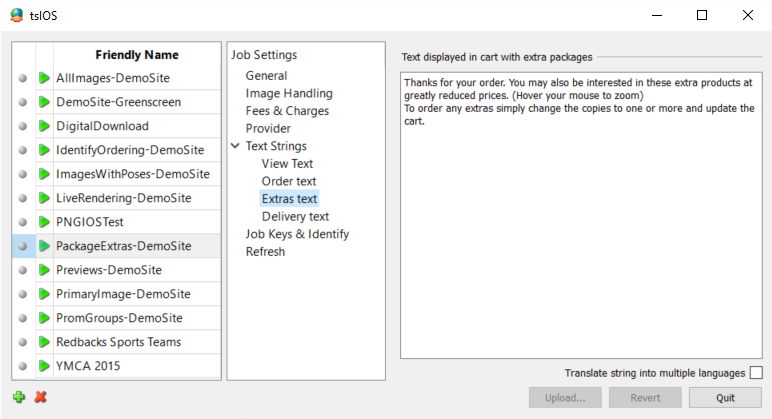 The text displayed in the cart with extra packages is customisable on a job per job basis through tsIOS when uploading or refreshing jobs. Simply enter custom text in the 'Extras text' object of tsIOS as shown in the screen grab below. The link below shows an example of using package extras as described above. Add anything to the cart then view the cart. Note regardless of what is ordered the Personalised Calendar is offered. "I want to offer Package Z as an extra no matter what they order"
Clear the cart then order the Deluxe Package. View the cart and note with the Deluxe Package the customer is offered a discounted set of bookmarks. "I want to offer Package X only if they order Package A"
Clear the cart then order something other than the Deluxe Package. View the cart and note the customer is not offered the bookmarks but is offered a Digital Download. "I want to offer Package Y if they order either Package B, C or D but not A"
Extra packages have the following limitations when compared to regular packages. The system will automatically handles situatons where the customer tries to "trick" the system. For example if the customer, after adding a regular package to the cart, then adds an extra package but subsequently removes the regular package, the extra package is also removed. If a package is offered as an extra for two (or more) different regular packages but at different prices and the customer orders both the regular packages, the extra package will be offered at the lower of the two prices.